An anti-war film about the modern art of remote combat, Good Kill makes its point early and then struggles to find a purpose. 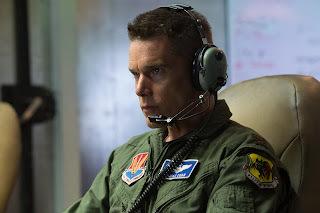 On the outskirts of Las Vegas, Major Thomas Egan (Ethan Hawke) works at a U.S. Air Force base remotely controlling killer drones over places like Afghanistan, Pakistan and Yemen, seeking and killing the enemies of the US in the war on terror. Egan is a veteran pilot used to flying actual combat missions in real war zones, and he is starting to seriously struggle with the detached remoteness of his drone assignment. His wife Molly (January Jones) takes the brunt of his descent into depression and alcoholism. Things go from bad to worse when Egan, his commander Lieutenant Colonel Jack Johns (Bruce Greenwood) and Airman First Class Vera Suarez (Zoë Kravitz) are placed under the command of missions ordered by the CIA with instructions received directly from Langley (via the detached voice of Peter Coyote). The intelligence agency is much less concerned about the rules of war and civilian casualties, and Egan finds himself growing increasingly uneasy with who he is being asked to kill and how he is doing the killing. An independent film directed by Andrew Niccol, Good Kill is a companion piece of sorts to the more well-rounded American Sniper. While also delving into the ravaging effects of contemporary war on the soldier at the tip of the spear, Good Kill adds the innovation of isolating the combatant from the combat zone. The video-game aspects of modern warfare are ironically intended to secure the soldier's health, but for Egan, who has experienced the thrill of being at personal risk over a live battlefield, the complete lack of danger as he control a joystick 7,000 miles from his targets is an emotionally unhinging experience. Niccol's script sets its course early and sticks to it, and as a result Good Kill cannot avoid falling into a repetitive trap. The psychological study of Egan's tumble into non-functionality features a recurring series of well-executed and often tense "good kills" on the monitor, alternating with snippets of a disintegrating home life and Egan staring at the sky. The one inflection point comes with the heavy-handed intervention of the CIA, demanding more kills that are maybe not so good. There are some debates among Egan's crew about the morality of the war and the method of killing, but precious little depth is achieved in character or narrative arc. Ethan Hawke does all that he can with the character of Egan, starting off uneasy and restless and linearly progressing towards an abyss where the personal and professional career self-destruct buttons begin to look tempting as seen through the bottom of a bottle. The rest of the characters are strictly predicable. Good Kill provides instructive commentary on the unexpected hazards of soulless, robotic bloodshed. Much like the world of controlling drones, the action on the monitor is immersive, but it is ultimately stuck in a box.